We need your opinion on a 1 question survey. This November, Houston will have elections for mayor and all city council seats. As we have seen across the country, in order to make positive changes that will save the lives of shelter pets, we need elected officials who are willing to work to make sure that lifesaving programs are implemented in shelters. For too many years, Houston has had many elected officials who do not care about sheltering issues and who have been willing to continue with “save a few and kill the rest” sheltering. We believe that animal lovers should discuss sheltering issues with the candidates to make sure that we vote for the people most likely to make positive changes for shelter pets. 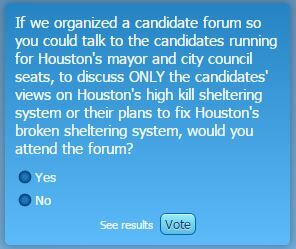 No Kill Houston and No Kill Texas Advocates are considering whether to organize a Candidate Forum so that animal lovers can talk to the candidates to learn their plans to fix Houston’s broken sheltering system. IF WE ORGANIZED A CANDIDATE FORUM, WOULD YOU ATTEND? CLICK ON THIS LINK TO VOTE YES OR NO. NOTE: This poll is ONLY for people who can vote in Houston. (If a large number of people vote Yes, we will then survey people regarding where and when such a Forum should take place). Please share for their lives.